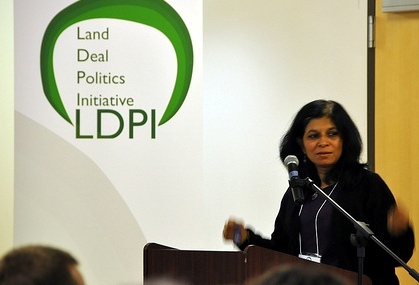 The Global Land Grabbing II conference at Cornell last week brought together an impressive range of people with different disciplines, views and experience on large scale land deals – a phenomenon that’s erupted worldwide in the wake of recent global crises. Supporters of large scale acquisitions of land make some big claims for them: that they help to boost economies, create jobs, make the most of ‘underused’ land and feed the hungry. These claims are examined and contested by those concerned about the violence and injustice that goes along with some large-scale land deals. As speakers at the conference showed, dodgy economics and even dodgier science join forces with powerful interests, with deals often negotiated behind closed doors. Even the participation of vulnerable groups in decisions about land is not what it seems: it can even be a method of controlling them without giving them a real say in what happens. One of the challenges for research is to deal with the secrecy, uncertainty and variability of land deals. How do we best measure and understand the scale, scope and effects of land grabs? What are the most constructive ways of resisting unscrupulous deals and violent takeovers? How can the (almost over-abundant) research on land grabs be useful for guiding activists and policy makers alike, and what are the political spaces for change, locally, nationally and at international level? One of those spaces is processes around the UN FAO, whose Director-General José Graziano da Silva addressed the conference on day 3. The Voluntary Guidelines on Tenure is one of a set of efforts to move towards global governance. But these and other guidelines at global level are non-binding: what happens when countries act on them will vary and depend on many factors, including local and national politics and balances of power. You can watch the video of José Graziano da Silva’s presentation on the conference website and download a copy of his speech. Another space for change is in building alliances between civil society, research, activists and authorities to shed light on land deals and find ways of making them work for poor people. The conference was one of the places where these alliances could be strengthened. For more presentations and interviews, there’s a YouTube playlist with presentations and interviews from the conference. The conference was hosted at Cornell University and organised by the Land Deals Politics Initiative, which includes Future Agricultures Consortium, the International Institute of Social Studies, the Institute of Poverty, Land and Agrarian Studies (PLAAS) and the Polson Institute for Global Development at Cornell University. For more STEPS research on different aspects of land grabbing, including ‘green grabs’ and ‘water grabs’ see the page of resources on land grabs on our website.